Designed for longwall mining applications, the MRUBL style consists of a urethane seal, nitrile o-ring energizer, and polyacetal anti-extrusion ring. The energizer ensures sealing under low pressure and cushions the seal against shock loads. 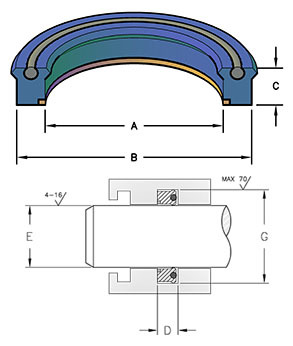 The anti-extrusion ring resists extrusion under side load and extreme pressure peaks.